Ollella And The Pourover Bar are at Somme Residence. Most might not have realised that it is a stone throw from City Square and the Farrer Park MRT station. It isn't as inconvenient a location that most might have imagined. Ollella specialises in Choux pastry and have collaborated with Raphael and Karen for coffee. As such you will notice that there is The Pourover Bar occupying a corner of the shop. When I entered Ollella, my attention was turned to the dinning area on my right. It has bar tables and chairs. But what caught my attention was the greens that are hung on the barrier and the flowers on the table. It is much like a garden. At the moment, Ollella is offerring 7 chouquette flavours. One will find the Vanilla ($4), Dark Chocolate ($4.50), Lemon Meringue ($4), Raspberry ($5), Apple Cinammon ($4), Tiramisu ($5) and Matcha Azuki ($4.50). I have a tough time deciding which 2 flavours I should be getting. As usual, I would love to have all of them. I am glad I did not succumbed to my greed. 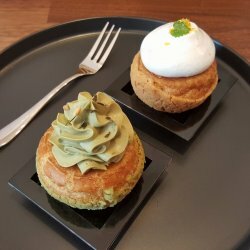 I went for the Lemon Meringue Chouquette ($4) and the Matcha Azuki ($4.50). The Lemon Meringue has a lemon curd within the choux pastry and a meringue on top of the choux resulting in a sourish and sweet pastry. The lemon curd was lightly sour. I wouldn't mind it to be more sourish. In short, it is a typical Lemon Meringue flavour. The Matcha Azuki has red bean within the choux pastry and a Matcha cream on top. Lightly green tea flavour coupled with generous red bean. Both the choux though were delish, there isn't any surprise element. For those who prefer to savour the plain choux pastry could go for the Chouquette. Beside the Chouquette, Ollella offers the Kueh Lapis and Choux Tart too. Ollella offers some tea blend to accompany their pastries. If diner prefer coffee, Ollella has The Pourover Bar to serve some V60 filter coffee and the Espresso based coffee. The coffee order could be done at the same time at Ollella. Karen and Raphael specialise in the Pourover coffee. The pair are very friendly and shares with customers a lot on coffee too. At the beginning, they offered beans roasted from Ninety Plus Coffee. A roastery hailed from Melbourne. There are beans from Tanazia, Ethiopia and Panama Gesha. The coffee offered by The Pourover Bar is steep and it is going to be hard to swallow by most coffee drinkers, unless you are coffee connoisseur. They believe in only providing the best to consumers. So expect a cup of pourover at $11 and above. The most expensive currently offered by The Pourover Bar is a Panama Gesha at $45. Ollella And The Pourover Bar as a pair offers fabulous pastries and high quality coffee. Such is a great collaboration for the SME in Singapore.